No...not together, but let me just take a moment to appreciate that mental image! Let's start with Keith shall we? 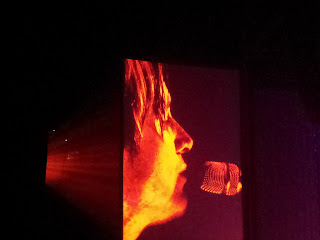 Last Sunday night I had the fantastic pleasure of going to see Keith Urban in concert. He was supported by Benji and Joel Madden who are now performing as The Madden Brothers. Keith's show was totally, totally awesome and I sang and danced from beginning to end! The crowd was totally involved, especially because he came out into different stages in the crowd to perform. In addition to all of his hits, he sang Wonderwall by Oasis with the Madden and Melbourne artist Missy Higgins came out and sang a Crowded House song. I was a lot more choosy about my companion this time. You may recall that last time I went to see Keith Urban in concert, I took my son and he slept through the entire show! I did say to my friend that I didn't care if she didn't enjoy herself she just had to stay awake! Fortunately, she did enjoy it. When I was looking for that link I just read the post I wrote last time I went and I could pretty much just say "ditto" because everything I loved last time was great again this time, but just better! Not only did I listen to his albums before the concert, I have also listened to them pretty much exclusively for the week afterwards (and I might just go and put it on again tonight). Why yes, I can be a little obsessive. 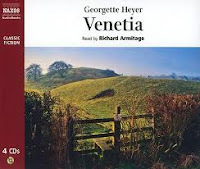 In fact, pretty much the only time I was listening to something and it wasn't Keith Urban, I was listening to another obsession, Richard Armitage narrate Venetia by Georgette Heyer. The book of Venetia was actually the first ever Georgette Heyer novel that I bought. I was in a specialist romance bookstore talking about how much I loved historical romance and the assistant was shocked when I said that I had never read any Georgette Heyer novels and she insisted that I needed to buy Venetia before I left the store. So I did. And then I put it on the bookshelf where it has stayed ever since despite the fact that I have read and loved quite a few of her book since. The opportunity of listening to Richard Armitage narrate though was too much to pass up so when I got some ITunes vouchers for Christmas it was one of the first things I bought. I loved the story itself, but I have to say that I could listen to RA talk for hours and hours and hours and hours. His normal voice is so melodious but he also manages to bring such distinct characterisation to all the characters whether they be male or female. The story itself is firmly in quintessential Heyer territory. Venetia is a young woman who has been left with the responsibility of looking after the family property and her younger brother whilst her older brother is off fighting a war. She has two suitors but she isn't really interested in either of them. One is young and very ardent and the other is very condescending and believes it is his right to act as though he already owns Venetia. Whilst out strolling one day, she meets Lord Damerel, scandalously infamous rake who is barely tolerated in polite society. So begins a delicate friendship that blossoms more and more into something that is beginning to look like love. He is, however, very much aware of how much damage it would do her reputation were he to pursue her and that is confirmed when her relatives learn of her interest and whisk her off to London out of harm's way...or so they thing. I loved the humour in this book, and think it may well be up there with my favourite Heyer books! I was a little bit surprised to find out that this was an abridged recording. My worst ever audiobook experience was an abridgement (it also had a really bad narrator) and so I am always reluctant to listen to abridged books. In that book, there was a scene where it reference two of the characters kissing which was never mentioned previously so it was a bit jarring. It is a testament to the people who did the abridgement that I don't feel like I missed out on much. Of course, I may find I am completely wrong should I actually decide to read the whole book at some point in the future. There are two other Heyer books that have been recorded featuring Richard Armitage; Sylvester which I have read before and The Convenient Marriage which I haven't read yet. I am a little reluctant to hand over $27 for an audiobook but if I get more giftcards any time soon it will be my first purchase! To give you just a taste of the pure bliss that is listening to this man's voice, here is a brief recording of him reading a scene from Elizabeth Gaskell's North and South. And just because I can, here is a video I have included before, but I still love watching it! So glad you had fun at the Keith Urban concert! I'm not a fan of audiobooks, but I am totally going to try listening to the Heyer novels read by Richard Armitage. His voice is so lovely that I could listen to him speak all day! My main issue with audiobooks is that I get too distracted to pay attention to them. I don't think anything could distract me from Mr. Armitage's voice though! I did find myself wanting to just sit in the car to keep on listening! Who was it who said that one's choice of companion is nearly as important as choosing the event itself? Yes, I remember a sad evening sobbing to a new movie of Hunchback of Notre Dame while my husband nodded off and snored. He was on an Australian talent show last year and it was so much more pleasurable than the other judges on AI. I have watched a bit of it and will continue to do so when I think of it but I am not going out of my way to remember! I've been meaning to try Georgette Heyer, and you just clinched it. My library has Venetia on CD; I've put it on hold. Thank you for the recommendation! I am so jealous that you got to go to a keith urban concert! He is one of my favorite singers. I am glad you liked your audiobook. I haven't read any of that author but now I want to try! If you ever get a chance to do go to one of his concerts go. He puts on a totally awesome show! Sounds like a fun concert! & Loved Richard Armitage on MI5!